JBL Horizon wurde bewertet mit 3.0 von 5 von 312. Rated 2 von 5 von Rockhound aus Elegantly flawed - Cannot see the numbers at night I really like the overall unique design of the Horizon; including the ambient alarm light (very effective), Bluetooth, USB charging ports, and decent sound. These features give it a star. However, the auto-dimming night display makes the clock unreadable at night, when it is used most. This problem is exacerbated by the highly reflective mirrored clock face, which reflects any bright object, such as light from a bedroom window, nightstand light, or glare from a TV. Hint: Its not good to put a mirror over something that is meant to be seen. Not being able to see the clock kills my rating of the product, which is otherwise quite handsome. 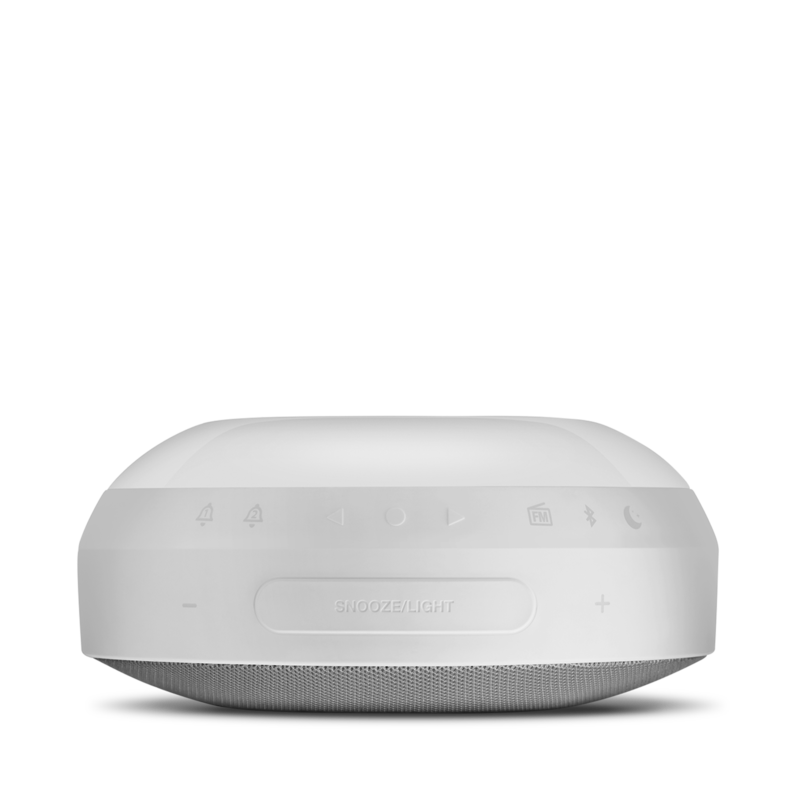 Rated 5 von 5 von Renderz73 aus Beyond a typical alarm clock! After owning this for a month, I had to order a second for my wife's side of the bed. 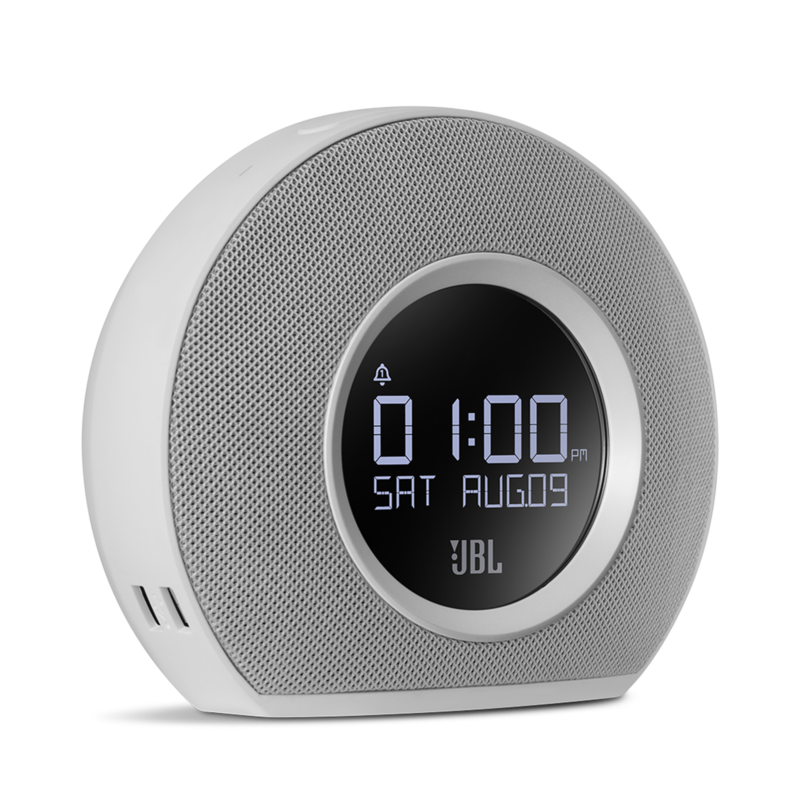 Multiple alarm modes(BT Device, Buzz, Radio, 3 custom sound tones, mood light on/off and volume setting). Also, it has auto dimming, as to not be super bright next to my bed at night. It does brighten up when the lights are on or my window shades are open. 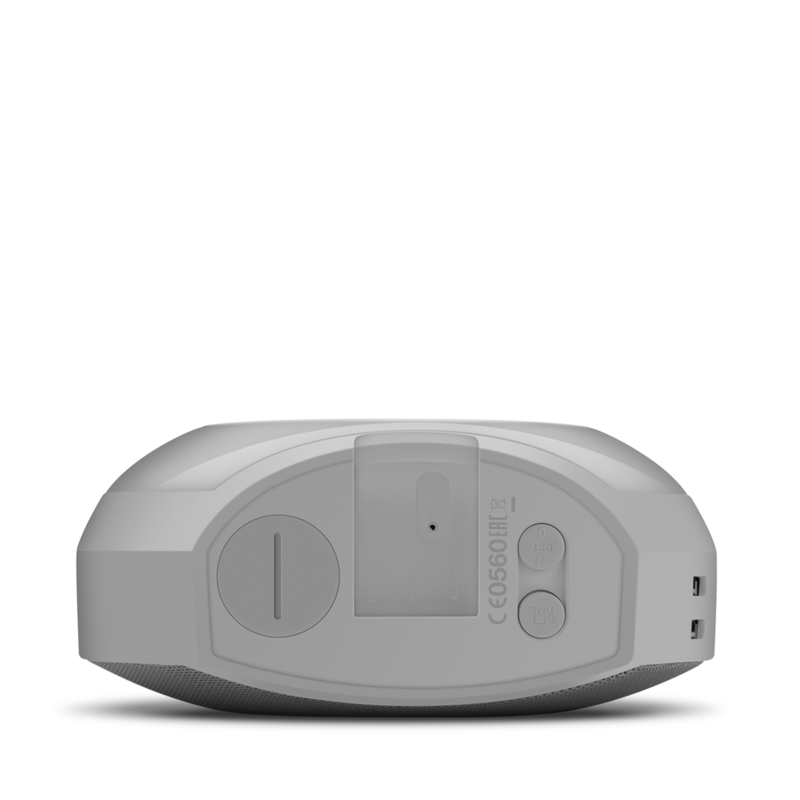 The bonus feature is the 2 USB port high speed charging. Lastly, the sound is excellent with Bluetooth audio streaming! Just what I would expect from JBL. Crisp highs, and tight bass. Rated 1 von 5 von Laurie005 aus nul: volume réveil assourdissant J'aurais dû regarder ces avis et les questions/réponses avant d'acheter!! comme visiblement beaucoup de monde je me suis fait avoir (à ce prix là pas d'autre mot) avec un radio réveil qui monte en 1min de volume 1 à 11 (le maximum qui reveille tout mon quartier) quand la radio se met en route à l'heure programmée. Qui a eu l'idée incongrue d'une telle augmentation de volume qui ne peut pas se règler??? Dommage car pour le reste il est super mais reconnaissez que c'est un point rédibitoire: un test clients avant mise en production vous aurait évité tant de clients insatisfaits!!! Rated 1 von 5 von whynot38 aus Volume sonore du réveil insupportable Je regrette l'achat de cet article. J'avais besoin d'un radio réveil, j'aime me réveiller en écoutant la radio. Mais là au bout de 30 secondes, le volume sonore est insupportable (monte jusqu'à 11 sans pouvoir lui imposer une limite !) et je bondis pour arrêter la radio. Du coup je m'en sers comme radio (le son est bon) et pour avoir l'heure. Et je fais sonner mon téléphone pour me réveiller... A ce prix là, c'est vraiment incroyable !!! 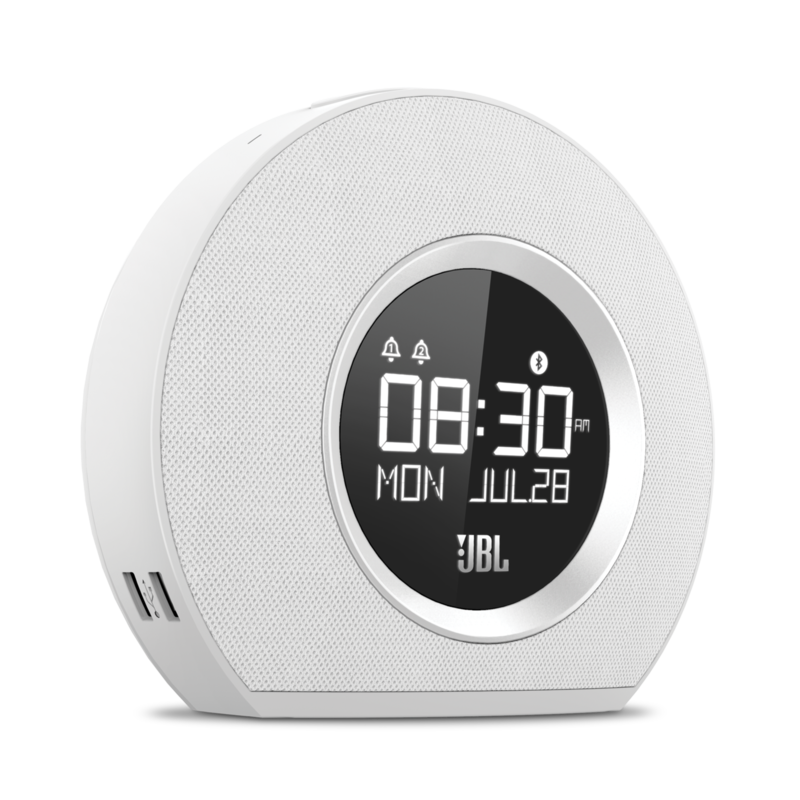 Rated 3 von 5 von kalvin aus Pretty Alarm Clock with Design Flaw after I moved to my new apartment I was so eager to buy a new alarm clock, but nothing fits my taste and suddenly I saw JBL Horizon which is fantastic alarm concept but after I bought it I found couple design flaw. 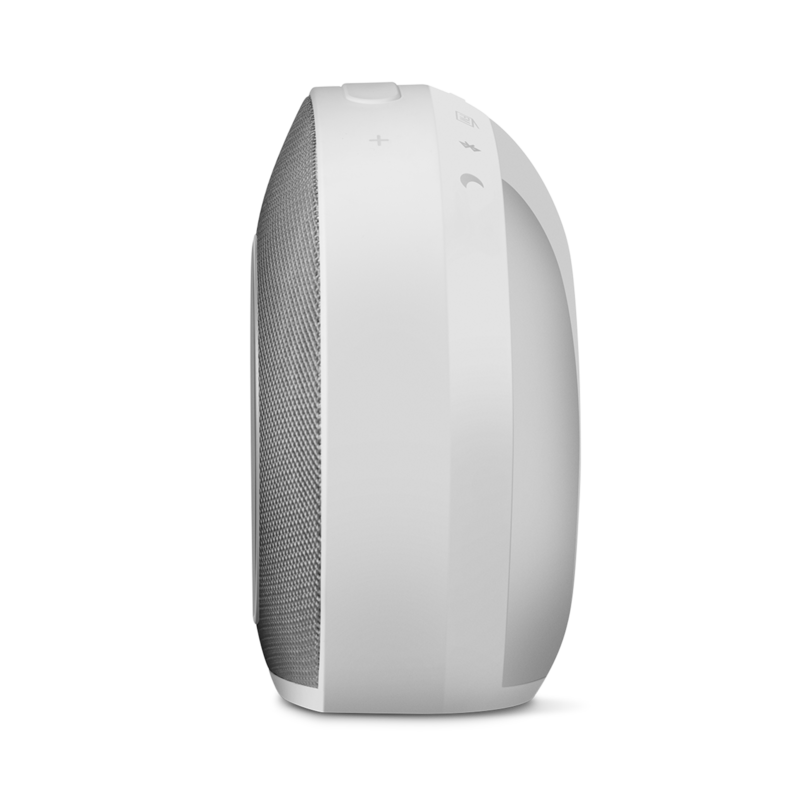 It was not terribly hard to use,sounds system are good, but I was expect it be little more. For instance when the alarm goes off in bluetooth mode, when u push snooze u can not play music from your cell, and the only way to do it cancel the alarm. And when it is connected by AUX or a iPhone dock there is a weird statistic noise which is not pleasing. And bluetooth connect I was expecting it auto connects to my phone after I come back to my apartment, but It didn't. I hope their engineer and designer can put little bit more time in this thing. 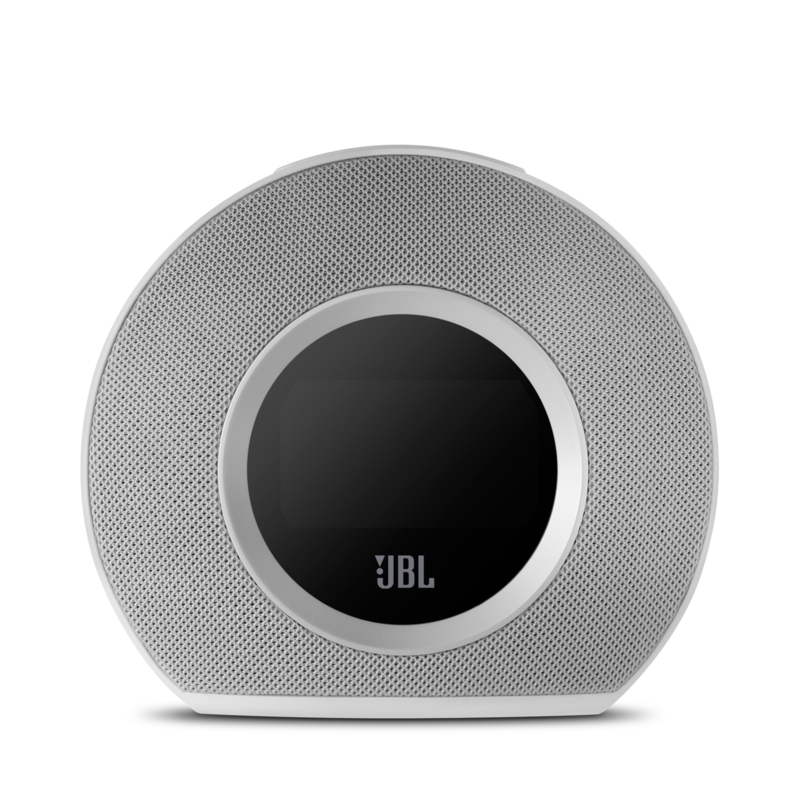 Cause It is JBL, people expect more from it. I try to preset the FM station but only able to get only one station, no matter how many time I try to scan. It looks like the device only search the frequency from 76Mhz to 90Mhz and never go beyond that range. est il possible de r&eacute;gler la luminosit&eacute; de l'heure? works with 220V? is it multivoltage? 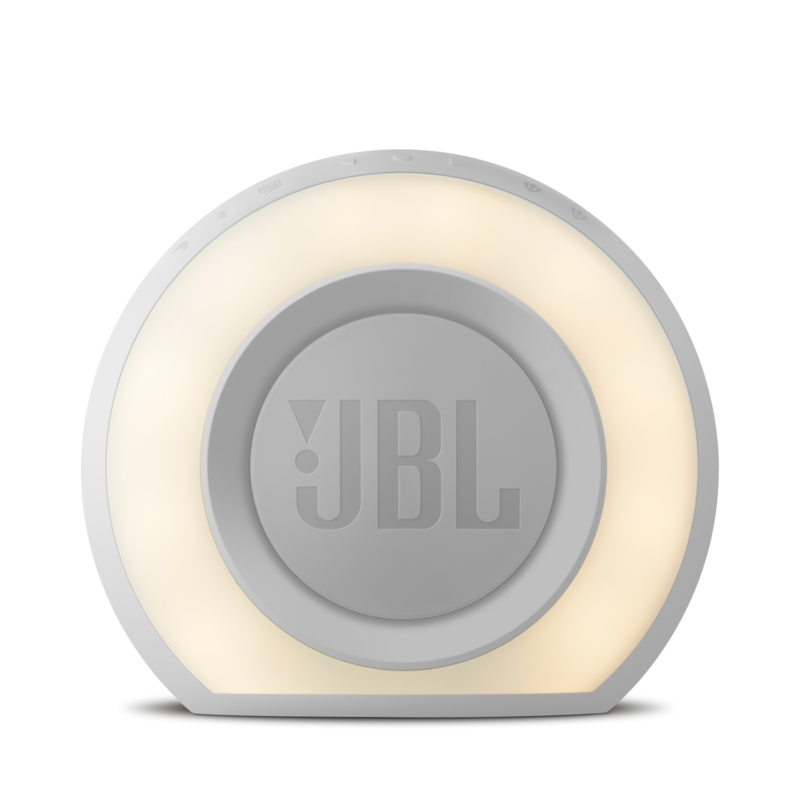 The JBL Horizon are auto-volt units that can be used in either 100-120V or 220-240V, 50-60Hz rated power sources. 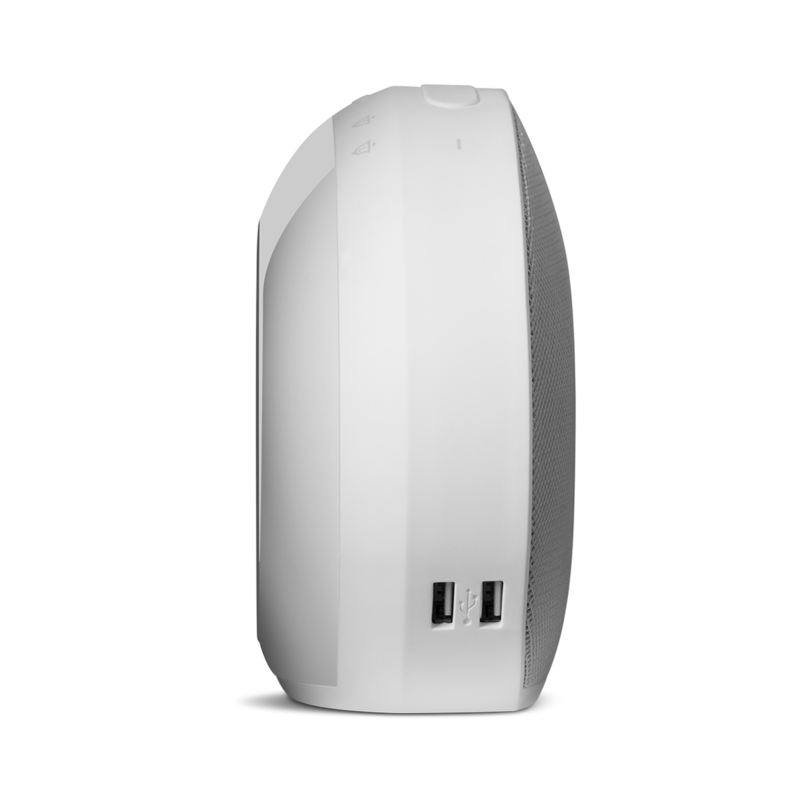 There would be no voltage issues when using it in other regions. Kan ik op de speakers ook muziek afspelen door hem te verbinden met een Aux kabeltje aan mijn smartphone? Bedankt voor uw vraag. Ja, er zit een AUX-IN op de JBL HORIZON waarmee u uw smartphone, tablet of computer kunt aansluiten. Indien u nog verdere &nbsp;ondersteuning wenst, gelieve dan het Harman Customer Support team te contacteren per telefoon, e-mail &nbsp;of chat voor directe hulp. Zie https://www.harmanaudio.nl/support-contact.html#ns voor meer informatie. Dank u. What does the DST button on the bottom do??? It allows you to turn on the Daylight Savings Time feature On/Off.